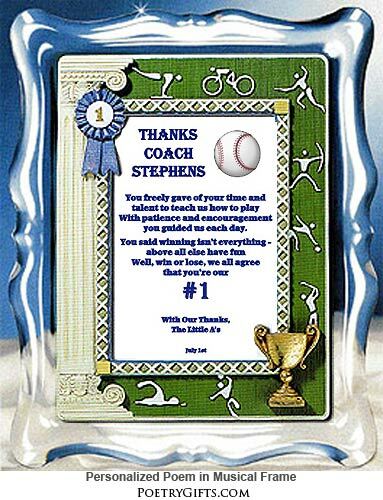 Here's a unique "Thank You" gift for a baseball coach from the team or an individual baseball player. 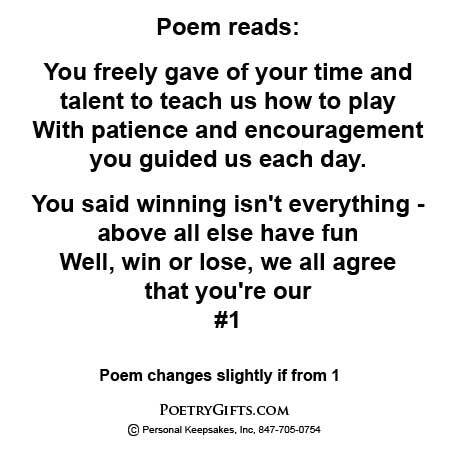 It's a great poem letting the coach know how much he or she is appreciated for the time and effort put into coaching - And the frame is musical! Personalize with names, date, and a personal message. This heartfelt poem and sports photo frame will surely become a favorite keepsake for the coach. A unique "Thank You" present to honor a coach or it can make a nice birthday present too! Fun "Thank You" gift for a baseball coach. Fill out the Personalization questions above, and we will create a custom gift for your son or daughter's baseball coach. A memorable gift for a memorable coach. Acrylic 3-dimensional frame with sport decals - outside frame dimensions 7" x 9"